These single plate sidewall registers are made to open and close when air flow distribution is needed. This white vent is crafted out of durable steel and is a traditional match for any room. Our sidewall register is meant only for the wall since the damper swings open in the back. Installation of your white vent will be quick since all you need to do is screw mount it into place. Screws come with the order. Our sidewall register has about a 3/16" depth to it’s side and the open fins are spaced at 1/3". The white vent finish has a powder coating which will help prevent the unit from tarnishing. Depth on side is 3/16"
Tip: Order your white vent according to the hole opening in your wall. A 10" x 8" sidewall register will fit into a hole opening that measure 10 x 8 inches. The faceplate dimensions will be slightly larger and vary from manufacturer to manufacturer. 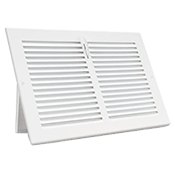 This white vent register comes with a unique, single plate damper and may not work with your hole opening. Check out our other sidewall registers for other styles and designs. When replacing your white vents in your home, order this sidewall register to have them ship straight to your door.